Principal Concept: There wasn’t much space for the new building in the 7000-person community of Absam, just 20 minutes by car from Innsbruck. So we – the only ones among the 20 competition participants – decided to situate the sports hall underground and, for structural reasons, build the two-story kindergarten atop in a lightweight wood frame construction. 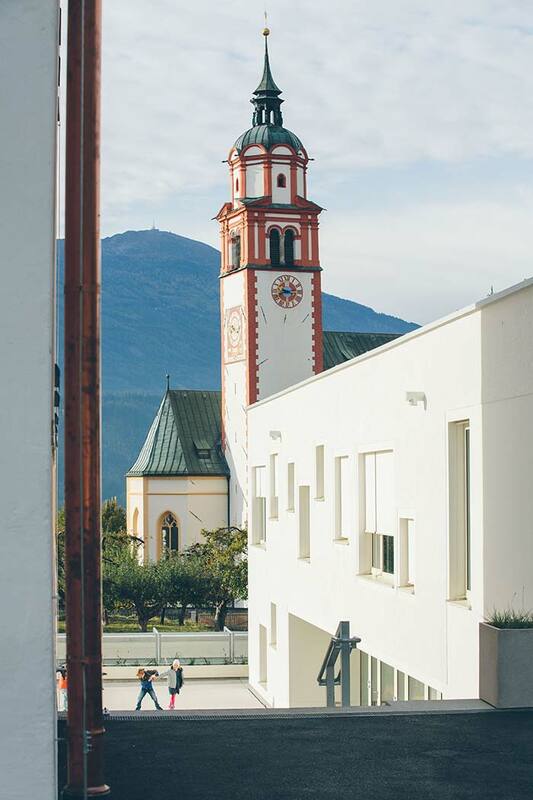 There wasn’t much space for the new building in the 7000-person community of Absam, the “village of the Olympians” in the Hall-Wattens region, just 20 minutes by car from Innsbruck. So the architects Schenker Salvi Weber decided to situate the sports hall underground and, for structural reasons, build the two-story kindergarten atop in a lightweight wood frame construction. 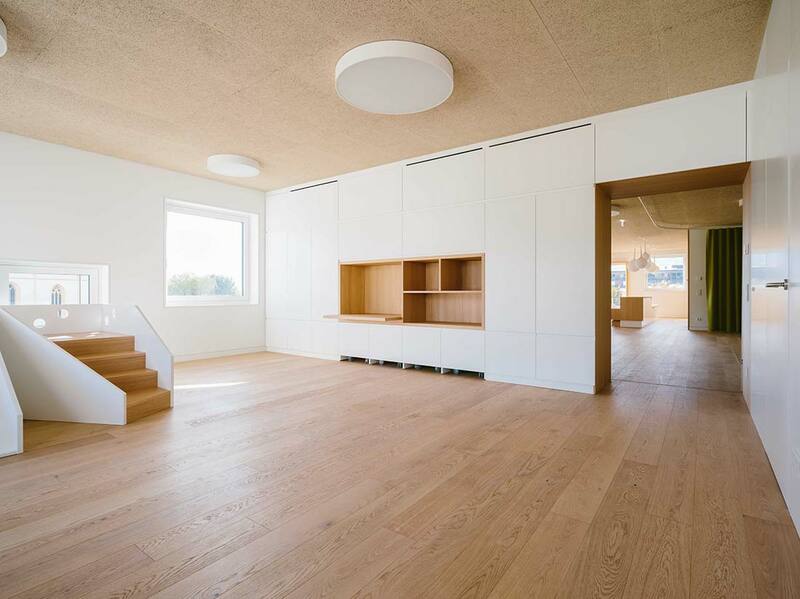 The interior of the passive house promotes a philosophy prevalent in the work of the architects. Here the rooms are structured into a harmonious spatial continuum, a playful learning landscape at a child’s scale with a diverse range of attractive views both to the outside and inside, horizontally and vertically. 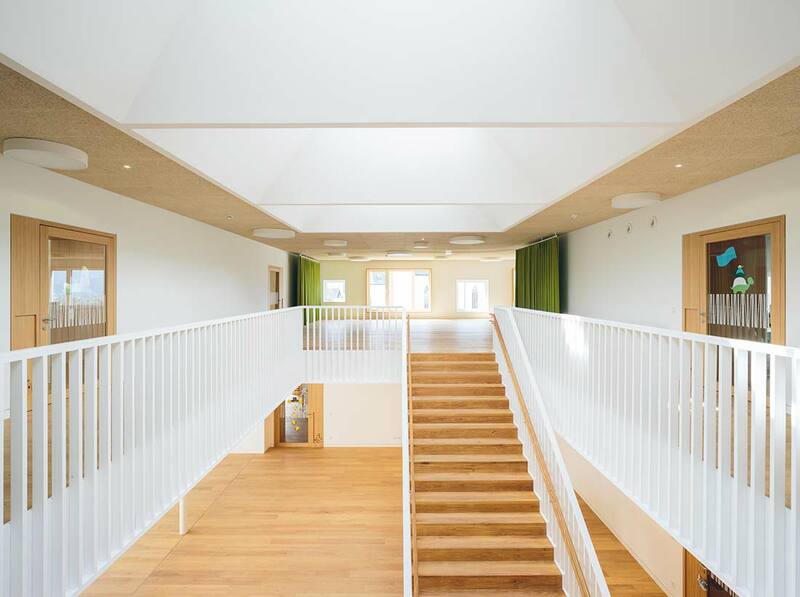 The house accommodates 120 kindergarten and 24 nursery places, which are distributed throughout eight group rooms. Different sized perforations in the façade have soffits you can sit on and offer framed views to nature literally “at eye level” – both for the little ones as well as adults. 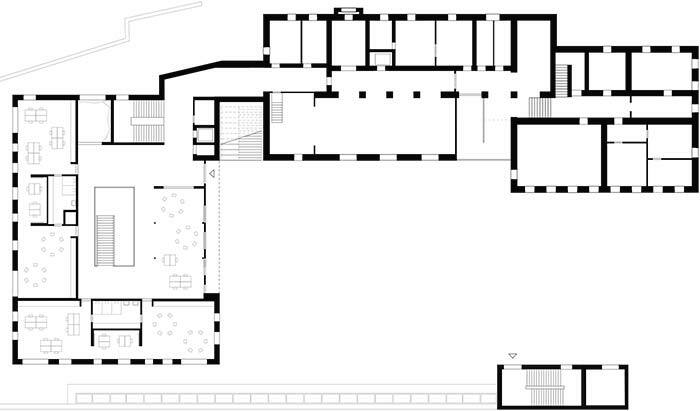 Niches, community spaces, open and intimate room sequences alternate and flow into one another. Their functions can be modified as desired by the supervisors through doors, curtains, and sliding panels, fostering spaces for smaller groups, creative games, or the afternoon nap while maintaining a good overview of all activities. The color and material concept – pastel colors with oiled oak wood furnishings, solid oak parquet floors, felt curtains, and light-brown wood wool acoustic ceilings – is consciously reserved, just like the high-quality oiled oak furniture designed by Schenker Salvi Weber and manufactured by regional handcraft businesses. The material concept of the kindergarten is continued in the underground 44 x 22 meter triple gymnasium with white wood wool acoustic ceilings and warm oak for the window frames, doors, handrails, and spectator stands. As a dominant accent, the architects selected the raw haptics of exposed concrete and bright mineral ceramic tiling, emphasizing a subterranean, mineral, and cavernous quality. The sports hall is connected to the primary school via an underground passageway. 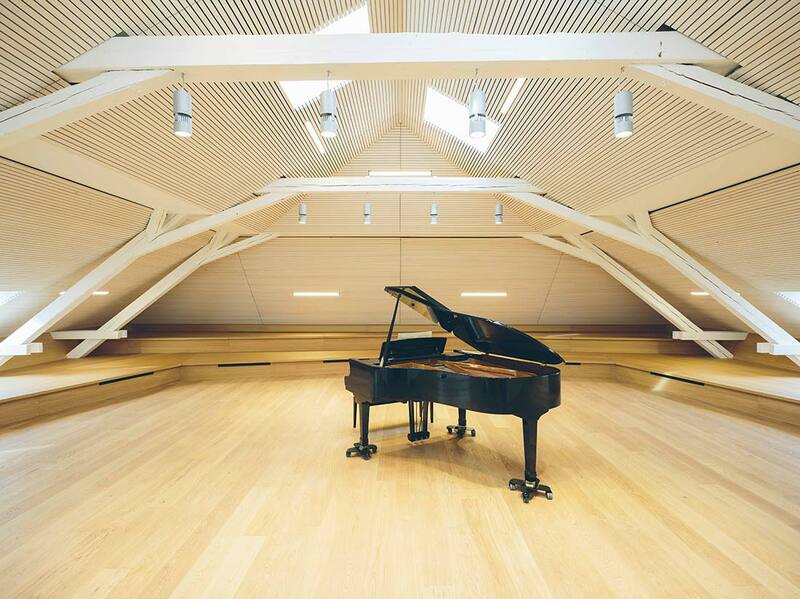 Under its historic hip roof a music school is housed on a mere 550 square meters with six rehearsal rooms and a large auditorium furnished with a generous, space-saving seating surface as opposed to chairs. 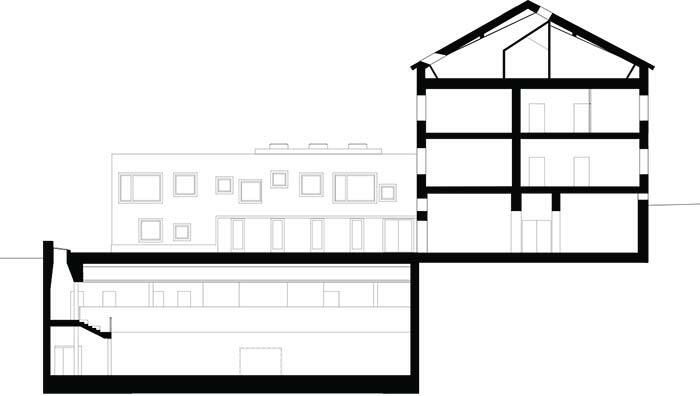 Reference is made to the materiality of the kindergarten and gymnasium here as well. 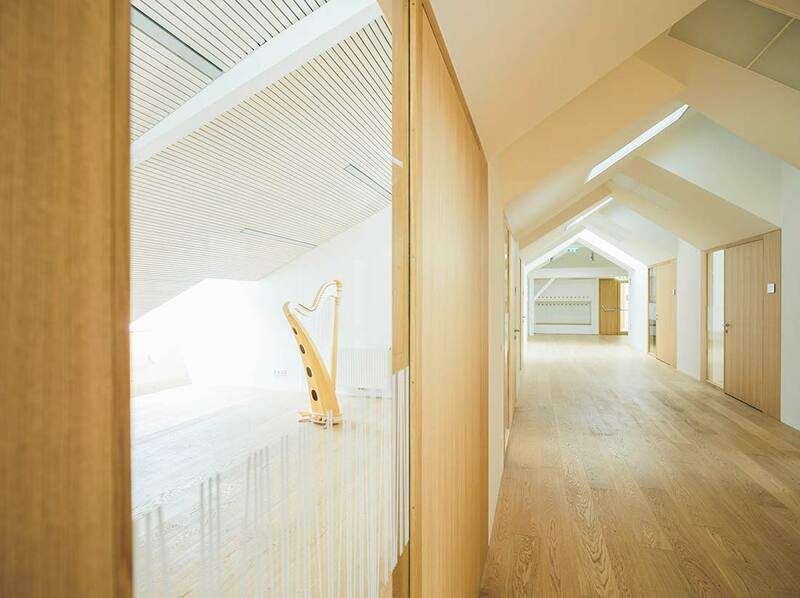 The warm oak wood combines elegantly with the white painted roof structure, and the acoustically-effective, white-glazed laths create a bright and festive atmosphere, making the smaller spaces seem all the more generous. The color and material concept – pastel colors with oiled oak wood furnishings, solid oak parquet floors, felt curtains, and light-brown wood wool acoustic ceilings – is consciously reserved, just like the high-quality oiled oak furniture designed by Schenker Salvi Weber and manufactured by regional handcraft businesses. The solid wood children’s tables and chairs were made by the Tyrolean furniture company Hussl.